When I tell people what I’m doing this month, they are surprised that there is a holiday every day of the month of November. When you think about it, though, there are a lot of silly holidays (like Bittersweet Chocolate with Almonds Day – seriously?! ), some made up by companies in order to promote their product, religious festivals, and every country has its own celebrations to honour important figures in their history. Today is one of those latter days. Happy Iqbal Day in Pakistan. 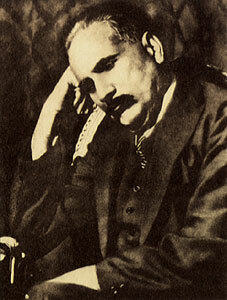 Today Pakistan honours the 134th birth anniversary of poet and philosopher Dr. Allama Muhammad Iqbal. A great influence on Pakistan’s culture and education system, Iqbal had a vision for a separate country for Muslims of the sub-continent, in which he inspired many through his revolutionary poetry and writings. Hamayun Iqbal Shami, a bureaucrat and philanthropist said on the occasion of the birth anniversary of the great poet that this is an apt opportunity for the World’s Muslims to realize the poet’s ideals and thoughts which are the glory and grandeur of the Islamic world. “He neither promoted the Western image of Islam nor was in favour of Talibanization, rather he had painted the real picture of Islam through the concepts taken from the Holy Quran”, he said. A changing of the guard at Iqbal’s tomb, special programs broadcasted on the television and radio, and a public holiday are some of the events happening in Pakistan to celebrate Iqbal’s life and poetry. I am not Muslim, nor Pakistani, so I cannot understand completely the history and meaning of this holiday without a lot of further study. I am, however, touched by his poems. Written in Persian and Urdu, Iqbal wrote over 12,000 verses of poetry which has been translated to many languages around the world. The territory of heart is vacuous for a long time. Come, let’s make a new shrine in this land. Our shrine should be taller than all the shrines of the world! We should make its spire touch the edge of the sky. [and] make all the worshippers drink the wine of love! [Both] power and peace are implied in the songs of the disciples. The salvation of the people of the world lies in love!